Reading comprehension worksheet on the impact of technology on family relationships. Writing activity and grammar exercises on reported questions, verb tenses and plural of nouns. Test elaborated under the topic "Technology". Reading comprehension, writing and grammar exercises. Sorry for any mistake you may find. Worksheet with different types of exercises on the first and second conditional. Test elaborated under the topic of "The importance of English". Reading comprehension, grammar and writing exercises. Key included. If you find any mistake, please tell me so that I can correct it. 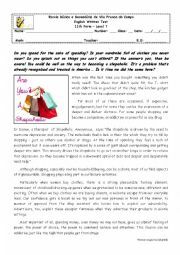 This is a test that I have prepared for my 11th grade students.It is about shopping addiction and it has got three different groups. Group I- reading comprehension; group II- grammar; group II- writing. Key included. 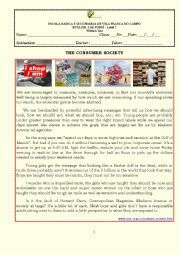 Test elaborated under the topic of "Consumer society". Reading comprehension, grammar and writing exercises. Key included. If you see any mistake, please tell me so that I can correct it afterwards. 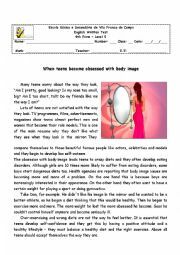 Reading comprehension test on teens´ obsession with body image.It´s an adapted version of another test that I have also uploaded today. It is aimed at students who are not very confortable with writing activities. There is also grammar practise on verb tenses and reported speech. 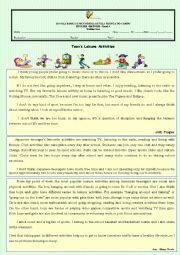 Test elaborated around the topic "leisure activities". Reading comprehension and grammar exercises. Key included. 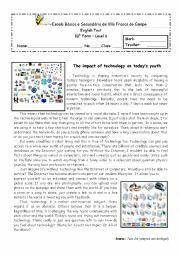 9th form test on the topic "Teens and Technology". Reading comprehension, grammar and writing. Powerpoint on countable and uncountable nouns and quantifiers. Hope it is useful! Powerpoint template by the ESL Printables member juanmi(m). Ppt to sum up ideas and information on the topic students and I have been developing in class. Powerpoint on the use and form of Will (future simple) and Be Going to... Please correct if you see any mistake. Definition of prepositional verbs followed by some examples. It is also presented the meaning of several prepositional verbs. Comparatives and superlatives of adjectives: use and form. Animated images that make the ppt a funny resource. Hope it is useful. This ppt presents some differences between British and American English in what concerns spelling, vocabulary and grammar. Please correct if you see any mistake. Hope it is useful. Ppt on the use of gerunds and infinitives. Ppt on relative pronouns. Use and rules presented after two matching exercises. Simple ppt to present some vocabulary on technological devices. The intention is also to make students become aware that technology is not only devices they love, such as computers and mobiles, but also devices we use frequently at home for different tasks. Ppt to help organising a composition on a certain topic. It has been used to develop a group writing activity in class.